When lovely spring weather arrived this week, I realized I revel in spring because it’s new every year – a season that never gets stale. Each year I anticipate spring, but no matter how much I try to conjure its distinguishing features, no matter how often I try to dream away winter’s dreariness by imagining the sunshine of spring, I cannot fully wrap myself in the glorious fullness of spring until that day when the daffodills open in splendor to trumpet at the sun, until the car windows can be rolled down with abandon, until the sun starts to gently warm my molecules and my spirit. 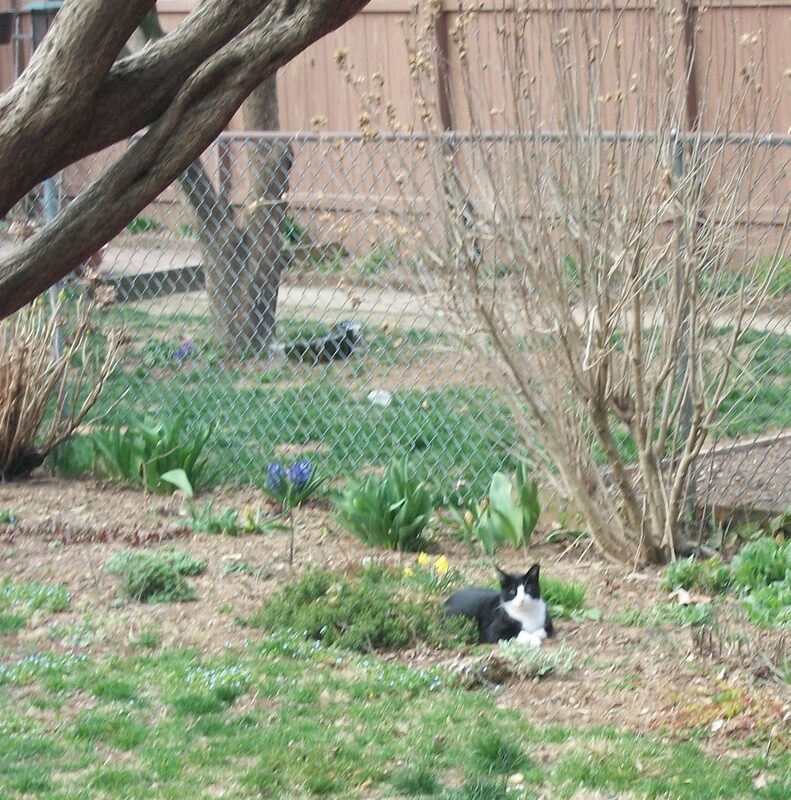 Here’s Olive, the neighborhood cat, enjoying the flowers of spring. Painted toenails – I’ve longed for open toed shoes for so long. Workout inspiration – A glum, “I should workout” mental stream is changing into self talk that sounds like, “Yeah, swimsuit season is coming. Fruits and veggies and some workout, I could be ready. Shoot, maybe I’ll even rock a bikini still.” Ok, maybe not the bikini, but this inspiring voice is going to get louder and louder until I do something crazy like a sit up. or a bicep curl. or a full-out kickboxing routine. Semester’s end on the horizon – Oh, hasten the day! This semester I’ve had the attention span of a squirrel…with ADD…who drank an espresso. Right now the rains of the first spring storm are washing winter away from the earth, and I am listening to them. I’ve flung the window open to spring. This entry was posted in that's life and tagged that's life. Bookmark the permalink.